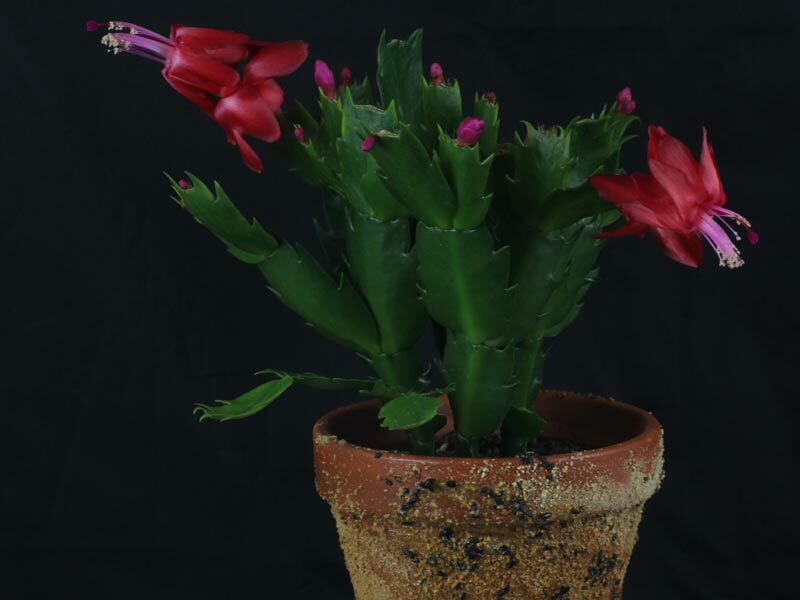 What is sold under the common names Christmas Cactus, Thanksgiving Cactus or Holiday Cactus are mostly hybrids (crossings) based on Schlumbergera truncata. There are many cultivars available, flowering from white to yellow, orange, red, pink or bicolor. In their natural habitat (Brazil) the members of the genus Schlumbergera are growing on trees (epiphytic) or rocks (lithophytic). Lighting: The Christmas Cactus thrives best in a location that is bright the year round with some morning or evening sun. Winter sun is also tolerated. Do not place in the midday sun in summer, unless you place it at least at a distance of 50 centimetres behind the window. During summer it can be placed in a spot in the garden or on the balcony that is shaded from rain and the direct midday sun. It must get used to the sun not being filtered through a window pain. If the temperatures start to fall to lower than 10 °C/50 °F lastingly, then it should be replaced indoors. 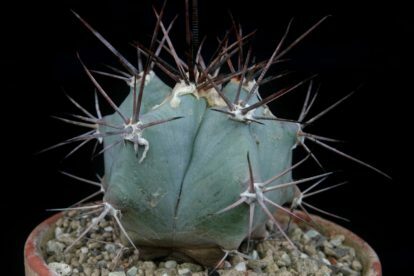 Soil: The substrate should be permeable and contain minerals; a general mix for cacti is very suitable. Anyone who is not in the habit of overwatering can also use a regular potting mix, which however, holds the water longer. It can be made more permeable if you mix in some clay granules. Watering: How often it should be watered depends on various factors, like for example the temperature, the substrate and the size of the plant in relation to the pot. From spring to autumn i water copiously. The Christmas Cactus then holds as much water as the earth can take. Any excess that leaks into the saucer must be removed after a few minutes as stagnant water can lead to rotting of the roots. The substrate can then be practically dry before i water again. If watering is needed can be gauged by the weight of the pot, wet soil is heavier than dry. Let the soil dry between the waterings to about 80 % or 90 % of the pots height. Feeding: It can be fertilised with the usual green plant or cactus fertiliser, always in half the recommended amount. I add cactus fertiliser once a month from April to September. Newly purchased or freshly repotted plants need no fertiliser in the first 12 months. 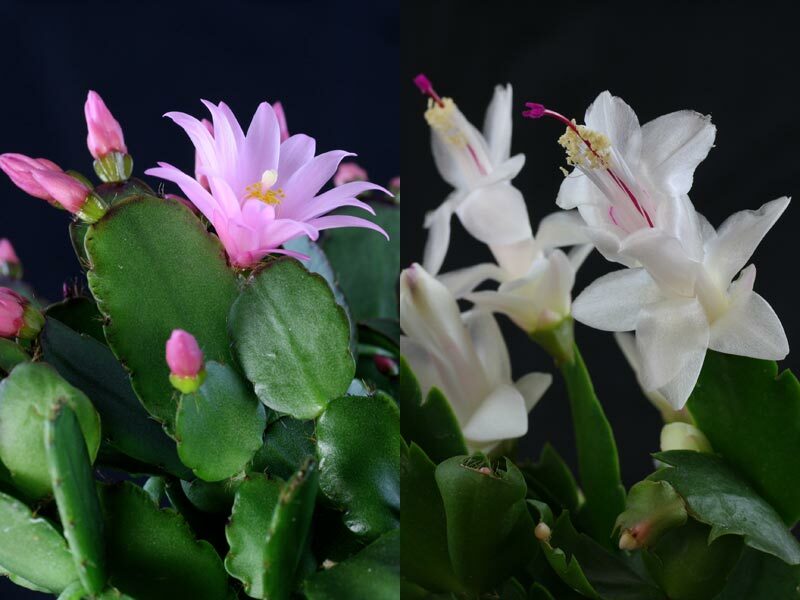 Reblooming: So that the Christmas Cactus forms its flowers it needs a quiet phase at temperatures between 10-17 °C/50-62 °F. During this time i keep it as good as dry and unfertilised. If it should bloom punctually for christmas, then it must be placed in the cooler location from September onwards. Now it should be only watered very lightly. If the buds have reached a size of about one centimetre the plant can be placed in a warmer spot again. Watering is not slowly increased. With a bit of luck the Christmas Cactus will bloom twice a year. You can promote this by placing it in a cooler spot after flowering and keep it dryer again. I only start with the fertilizer again when the new cactus joints form in the spring. 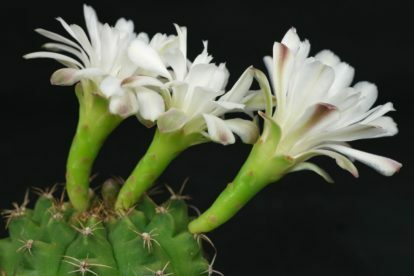 Christmas Cacti can easily be differed from Easter Cacti (Hatiora) by their leaves and flowers. There are hybrids between both species available. 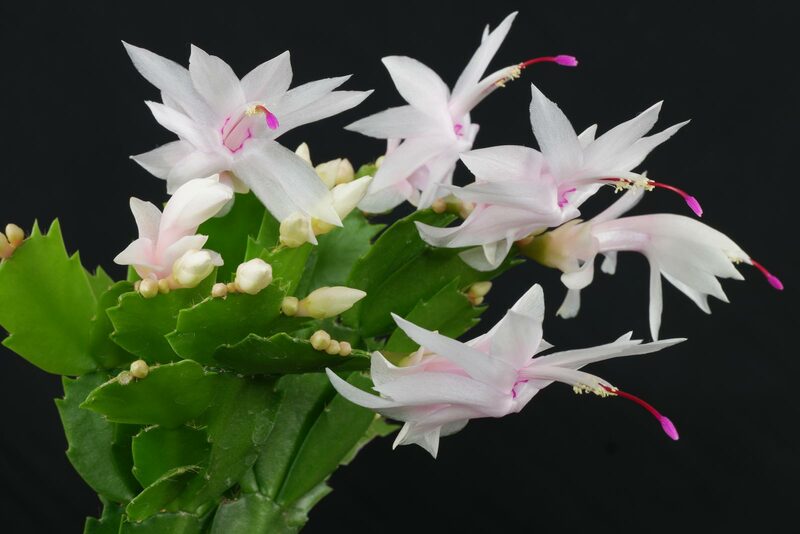 The members of the genus Schlumbergera can be propagated in two ways, either by buying seeds available in special cacti shops or with cuttings. 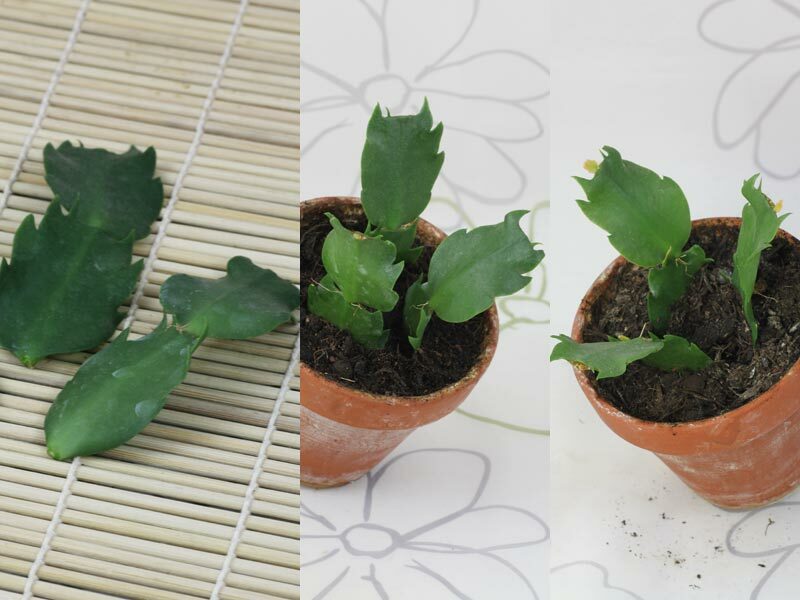 Cuttings: For cutting propagation several cacti shoots can be removed from the parent plant with a clean knife. These may be laid in a spot out of the sun for two to three days, or planted immediately. I have had good experiences with both methods. The depth of the plant is between 1 and 3 centimetres. For substrate a regular cactus mix can be used. Keep the soil evenly moist, but not too wet. Water only when the surface is dry. There is no need to fertilise. In order to increase the humidity you can place a freezer bag over the pot. But this is no absolutely necessary. If this is done, however, you must air it once a day to make sure no mould forms. The best spot for thriving the cuttings is bright but out of direct sunlight, at temperatures between 22-28 °c/72-82 °c. Seeds: Seeds for Schlumbergera cacti are available in special cacti shops. Or dust the plants yourself with a paintbrush. 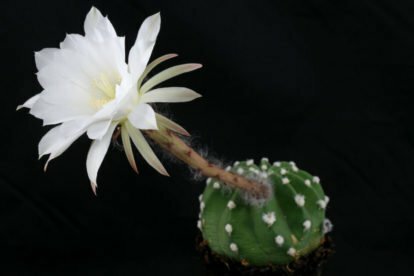 The members of this genus are not self-fertile however (self-pollinating), so you need several cacti. So-called clones, that is to say plants propagated by plugs, are not suitable to dust together or to dust the parent plant. Christmas Cacti are light germinators, the seeds must therefore be placed only on the pre-moistened substrate and lightly pressed on. 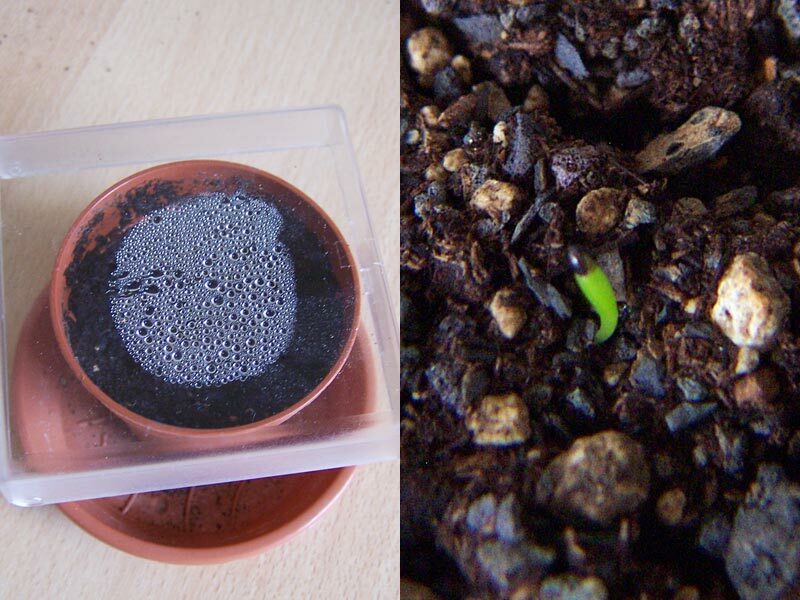 For germination they need a high humidity and should thus cover the germination tray with cling-film or similar. Air daily, so that no mould forms. 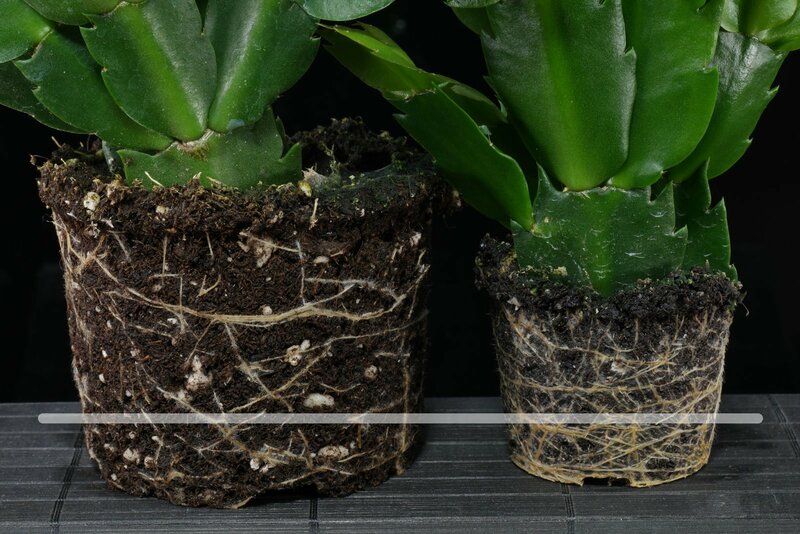 The location for growing the Schlumbergera seedlings must be bright but proteced from direct sunlight, and at temperatures +/- 25 °C/77 °F. Keep the soil evenly moist, but not too wet and don’t fertilise.